There have been many rankings of universities around the world that mainly focused on quality of academic, research paper, teaching staff and facilities and etc. A new university ranking approach is being used now to gauge the performance of universities in United Stated of America using "Value for Money" criteria. And the result is shocking and a dismay to many reputable universities. The new approach of SMI rankings are meant to highlight schools that do the best job of helping disadvantaged students graduate with the ability to start a career free of crushing levels of debt. 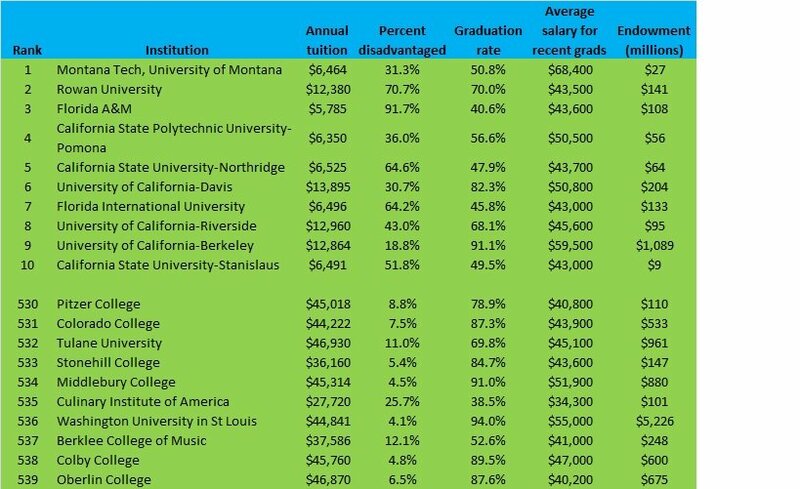 Five criteria determine the SMI rankings: tuition, percentage of the student body from low-income households, graduation rate, salaries of grads once they start working, and the size of each school’s endowment. Princeton, Harvard and Yale, which are first, second and third in the U.S. News college rankings, are 360th, 438th and 440th respectively based on the SMI listings. Anybody who studies lists of best colleges is used to seeing Ivy League schools and a few other elite perennials filling the top 10. But in a new list of rankings meant to identify the best colleges for lower-income students, the Ivies are closer to the bottom than the top. The biggest differentiator between high-ranked schools and low-ranked ones in the SMI rankings is the price tag. Average annual tuition among the top 10 schools on the SMI list is $9,021. Among the bottom 10, it’s $42,042. Expensive schools often point out that few students pay the full freight, but still, loans and grants go a lot further toward knocking down tuition costs when the list price is $9,000 than when it’s five times as high. Graduation rates are higher at the pricey schools near the bottom of the list than the cheaper schools near the top, with the top 10 averaging 60.3% and the bottom 10 averaging 77.4%. But that could reflect cultural factors such as rich schools’ ability to cherry-pick better students. Even so, the biggest losers in the higher-ed arms race are students who take out loans for school but fail to get a degree, since they end up bearing the cost of college without the benefit. In that regard, dropping out of a cheap school is better than leaving an expensive one, if you took on debt to pay part of the cost. There are limitations to the SMI rankings. The analysis covers 539 colleges but excludes hundreds of others because CollegeNet used third-party data rather than information supplied by the colleges themselves, and couldn't get data on all institutions. Future versions of the rankings should be more inclusive. And even though CollegeNet dubs its rankings a "social mobility index" -- which implies generation-to-generation improvements in living standards -- they only capture data for a given year, providing less-comprehensive analysis than the name may suggest. Of course, when applying to college, students should also consider factors that can't be captured by rankings. Even at schools that seem like a good value, higher salaries tend to go to grads who pursue quantitative and technical studies, which means art and sociology majors may still struggle after graduating from any of the top 10 schools. At public schools, cheap tuition may be available to in-state students only, with out-of-staters having to pay considerably more. And students able to nab generous amounts of financial aid—especially grants and scholarships that don’t need to be paid back—might still be better off at the most reputable school they can get into. But with average student debt soaring close to $30,000 per borrower, many students and their families have begun to consider the price of college an investment that’s only worthwhile if it earns a return higher than the upfront cost. The obsession with rankings tends to emphasize tiny gradations of betterness among colleges, while obscuring the whole question of value and cost-benefit analysis. The Washington Monthly recently tried to improve upon traditional college rankings by listing the 20 worst schools, calling out those with especially high tuition, low graduation rates and a high proportion of students who default on loans. The basic message: It’s probably not worth taking out $50,000 in loans to attend a school that will leave you poorly prepared for the job market. A college degree has become more important at the same time as it’s gotten far more expensive. Instead of making college more accessible, state budget cuts and rising tuition during the last decade or so have raised new barriers to attaining a college degree. Better-informed customers—a.k.a. students—and more tools for measuring the value of college may finally start to lower barriers that need to come down. Please read also below related articles. You can find the articles on the right hand navigation menu. 1. Student Loan - borrow or not?